Members of Theta Delta Chi fraternity pose with American Cancer Society staff and local volunteers at the conclusion of Montgomery County's first-ever Making Strides Against Breast Cancer walk. 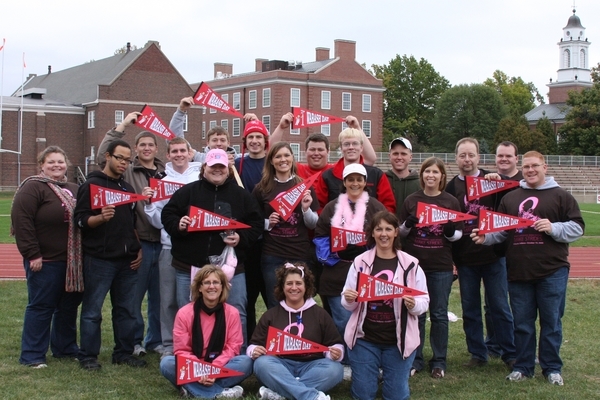 The College hosted the event as part of WABASH Day, and more than 250 walkers raised more than $32,000 to fight breast cancer. The Theta Delts who pitched in were Michael Hodge, Michael Wittman, Jordan Ferguson, Joe Granger, Matt Meyer, Jake Moore, Chris Zabriskie, and Bill Birch.